Environmental concerns can greatly affect business success, regardless of whether a business person or corporation shares those concerns. Today's corporate managers must understand the power of environmental issues, and shift their mindset from one focused on environmental "management" to one focused on strategy. The book ends with an overall discussion of competitive environmental strategy and draws connections to the emerging issue of sustainable development. Each chapter features insets that ask fundamental questions about the relationship between environmental protection and business strategy, and ends with a list of additional recommended readings. Every individual who wishes to engage in business management in the 21st century will need an appreciation for the implications of environmental issues on corporate activities, and vice-versa. 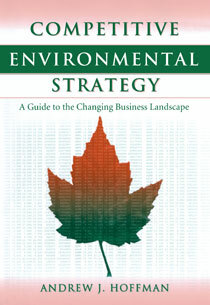 Competitive Environmental Strategy offers a valuable overview of the subject, and provides a wealth of real-world examples that demonstrate the validity and applicability of the concepts for business people, clearly showing how managers are turning an understanding of environmental issues to competitive advantage. PART III. New "Rules of the Game"